I first met Stanley Cooper in the late 1980s at a Tai Chi class at Rochford Community Centre. At that time he was around eighty-four years old, lively, humorous, outgoing and full of intelligent conversation. We got chatting over the following weeks, and it transpired that he lived quite close to me. He was obviously quite a character; he invited me for coffee, and so began a dozen years of close friendship. His interests were varied and far ranging. He was a great naturalist, ecologist and conservationist and an active member in the Castle Point Branch of the Essex Wildlife Trust. I remember delivering the Essex Wildlife magazines with him, in his cream coloured 1960s VW Transporter, which was a familiar sight locally. Stanley lived on family land behind his brother, Harold Cooper’s bungalow, ‘Birchlea’ which was situated down a private road in Badgers Way. 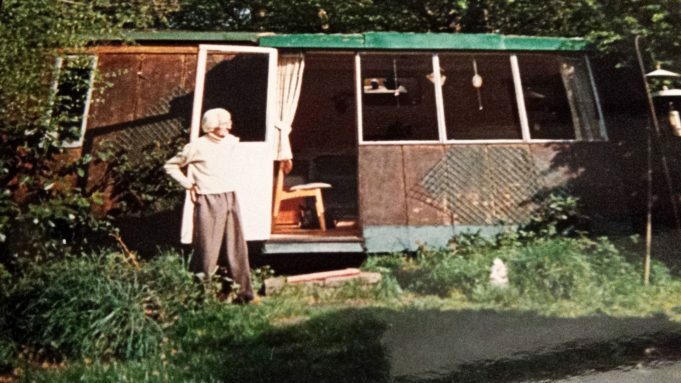 Stanley had bought himself a 1920s railway carriage when he was coming up for retirement in the 1960s, which was delivered by rail to Rayleigh Station, and thence by road, (heaven knows how!) to Badgers Way. This served as a comfortable living room, kitchen, and utility room, while he slept in his camper van in the car port behind it. He had a composting toilet, always full of clean fresh hay. Stanley had a keen interest in Naturopathy, Yoga, and the eastern disciplines, together with Theosophy and the esoteric. He told me that when he borrowed books from Hadleigh Library, he always returned them with notes interleaved inside, and through this method met several like minded souls who became friends. He had an eclectic mix of friends, – potters, artists, dancers and writers among them. His parents had moved to the area in the 1920s, and had bought several acres of land, (including where Badgers Way and Malyons now stand) running back from the Kiln Road to Shipwrights Wood. His father, John Albert Cooper, had owned a jewellers shop in Wanstead, East London, but was interested in dabbling in the smallholding world. For a time they kept pigs and sheep on their land. The family were of Huguenot extraction. In the 1930s, Stanley’s mother, Florence, was the Postmistress at Kiln Road Post Office while his father ran the attached General Stores. Stanley was a carpenter by trade, and worked on many local projects including the parade of shops in Hadleigh High Street. In 1923 he and his father put in building alteration plans (Seax D/UBe 2/1/190 refers) for the Kiln Road Shop, to bridge the gap between two buildings. This created that distinctive frontage with the small upper bay window that is still there today in the house that was the old Post Office/General Stores. Towards his retirement in the 1960s, Stanley taught carpentry at Southend Technical College. By 1961, both his parents had died, and the brothers sold the shop and post office in Kiln Road, together with some of the land, keeping five acres. In the mid 1990s, when Stanley was building a fence for me, I remember being horrified when he drove his VW Transporter straight into the lorry entrance at the old Benfleet Woodyard opposite the Junior School to buy wood. There were fork-lifts operating, and flat-bed lorries in and out, and I just shut my eyes. He was perfectly at home. The staff there knew and respected him, and we bought the supplies and off we went. 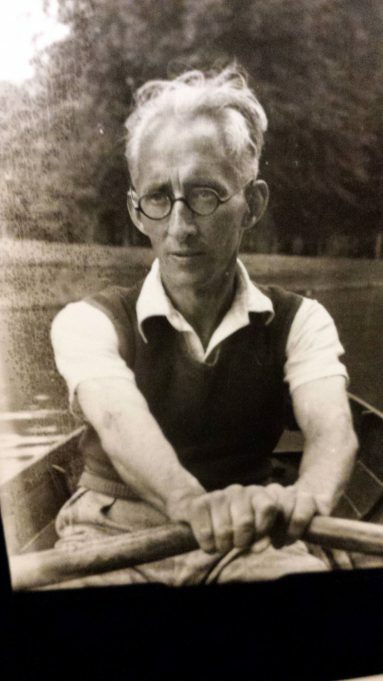 Stanley had four brothers – Jack, the eldest, (who had died in 1984), Harold, Eric and Bernard – and a sister, Florence, who sadly died at the age of fifty. She had a seizure while driving down Bread & Cheese Hill. That is all I know about the accident, which must have absolutely rocked the family. 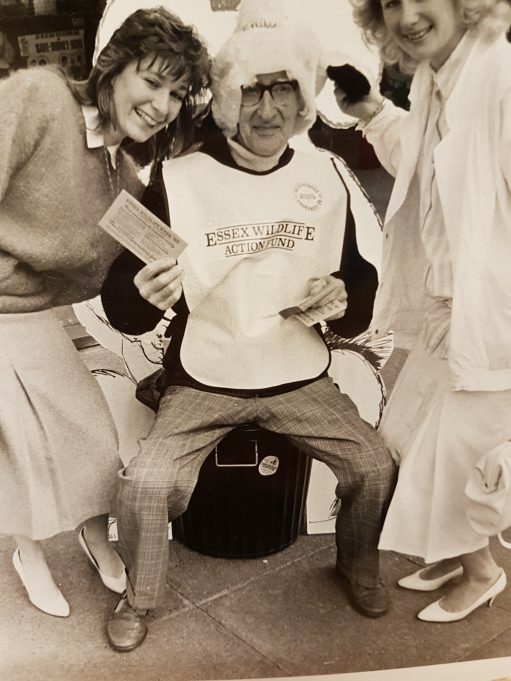 Eric and his wife Mona, and daughter Cheryl, lived at Glen Rosa opposite the Council Offices (the house is still there, bearing the same name). Mona started the San Toy School of Dancing, which still exists. Bernard, a retired Civil Servant, and his wife Winifred, ‘Winnie’, lived ‘down the hill’ in ‘Glen Tane’, a detached chalet bungalow at number 22 Manor Road (which has since been made into a house). Winnie was ‘quite a girl’ in the 1920s; she drove a car, (which was unusual for a woman in those days) and was a leading light in the local tennis club. I came to know Bernard very well as he shared Stanley’s interest in wildlife, and regularly went up to ‘the land’ to feed the birds and help Stanley with any tree-work. He fed several tame Robins from his hand. 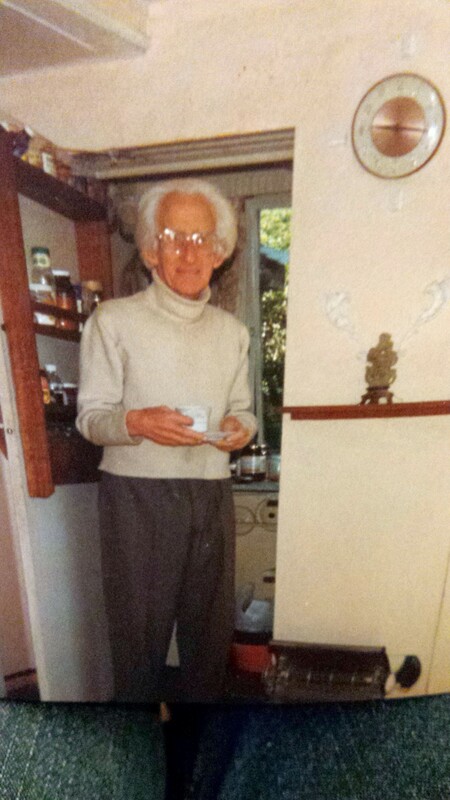 Bernard was a keen gardener, and always had a selection of planters outside No. 22 filled with colourful bedding plants which he grew from seed in his greenhouse. When the sweet smelling white Alyssum had gone over, he saved it, dried it, and took armfuls of it up to leave at the mouth of the badger setts for their bedding. They obviously appreciated it, as it would all be gone by the next morning. He was also President of the local Institute of Advanced Motoring, and encouraged me to take the course and pass the test. 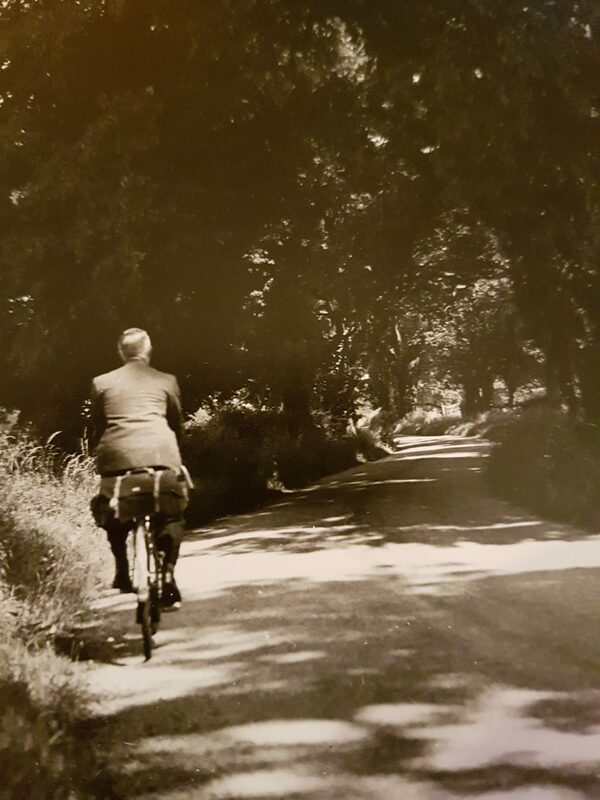 Bernard used to put his old black labrador, Bruno, in his car and drive up to visit Stanley, and walk the dog through their land to Thundersley Glen. It amused him greatly to be hailed as ‘Moses’ by the local dog walkers with whom he became friendly. Indeed, I could see the resemblance – as, in common with all the male members of the Cooper family, he had aquiline features, collar length flowing white locks and used a walking staff! He was a familiar figure in the Glen in the 1990s. Stanley’s memories were of a very different Kiln Road. There very few cars in the 1920s, and most people had a pony and trap. There were several tiny shacks in Kiln road. He remembered noticing newspaper had been used to paper the walls. Stanley remembered charabanc outings to Southend on high days and holidays. He also told me that when he was a young man, one could walk through the Glen and down to Benfleet Creek through woodland footpaths. The brothers also regularly walked through ‘Forty Acres’, part of which forms Woodside Park now. As children Bernard and Stanley famously tried to row a tin bath across the pond at Forty Acres. It sank, of course, and two very muddy boys dripped their way home where a telling-off awaited them. I remember Stanley recounting with glee that Bernard, as a teenager, crept home late one night from a tryst with a girlfriend. Shoes in hand, he climbed through a window, trod on a large slug in his stockinged feet and skidded the entire length of the floorboards. He crashed into a china laden dresser and woke the entire household. The Coopers’ family doctor, whose name escapes me, lived in a red brick house at Victoria House Corner. 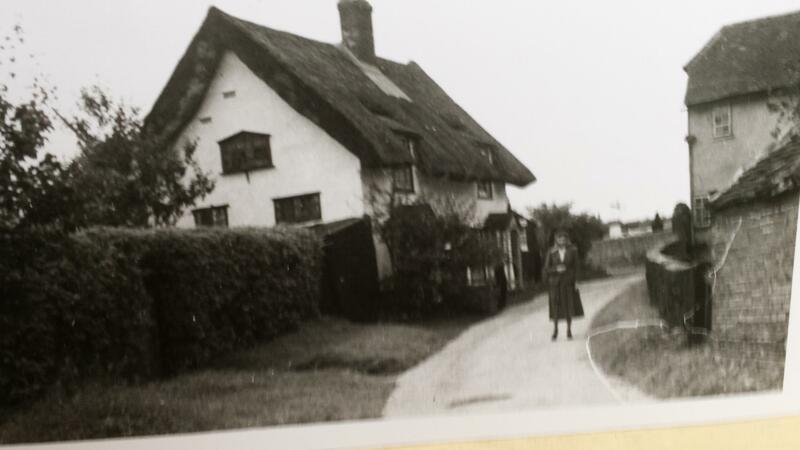 The Coopers were friendly with a family in ‘Hazlewood House’ in Kiln Road. I remember in the 1990s Bernard had some correspondence with a member of the family who had lived there and emigrated to Canada, and who had taken some aerial photographs of the area. Stanley also mentioned knowing the family at ‘Hallamshire’ in Kiln Road. They also knew the Mummeries, who owned the plant nursery where Ashcroft Place now stands. Harold Cooper was a keen amateur photographer, and took several of the black and white photographs in this article. He was a widower by the time I met Stanley, his wife Adelaide having died some years before. He lived with his grandson Glen in Birchlea. Harold’s son, Laurie had moved up north. When Harold’s bungalow, ‘Birchlea’ was built in the 1930s, it was registered as being ‘off Kiln Road’, in the middle of his father’s land. It was on Stanley’s land that I saw my first glow worm, and my first badger, and he introduced me to the bluebells in Shipwright’s Wood. Stanley used to feed the badgers with dog food and they came up to his house each evening. There were a variety of birds in his woodland including Tree Creepers, Great and Lesser Spotted Woodpeckers, Cuckoos, Robins, Hedge Sparrows, Jays and Nightingales. The squirrels were a nuisance, stealing the bird food from the feeders Stanley strung up in the large Hornbeam bush outside his windows. He devised an ingenious ‘hat’ for the feeders, which deterred most of them. I remember the various habitats on his land, which sloped gently down from the flat clearing where he had placed his railway carriage. Here there was an old coppiced Birch with three main branches beside a natural dew pond. The slope began after a patch of garden, culminating in a quite marshy area where the family land joined Shipwrights Wood via a private gate. Here, only Equisetum would grow. 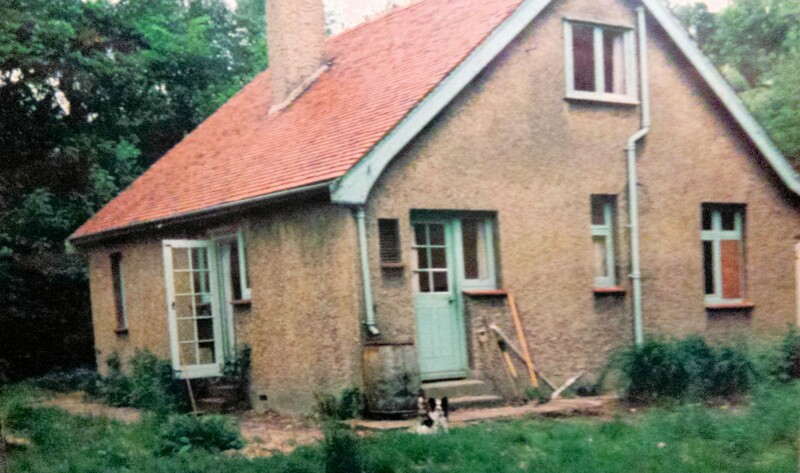 At the top, it was a lighter, more sandy soil, and when he had helped his brother Harold build ‘Birchlea’ in the 1930s, they dug a well here, bricking up the sides as they went. The trees were all natives, – Aspen, Sycamore, Birch, Hawthorn, Hornbeam, and there were wild roses. I look back on these years with a great deal of fondness, they really were halcyon days. They were delightful people, and, it seemed, the last summer breath of a more gracious age. 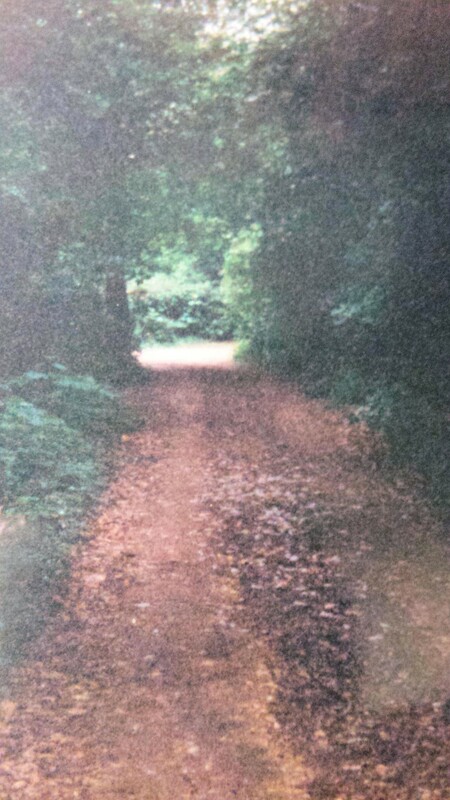 After Stanley’s death, on the eve of the millennium, in accordance with his wishes, his land was given to the Essex Wildlife Trust to be a restricted access nature reserve, – ‘Coopers Wood’. I can remember Mona and her sister running The San Toy School of Dance. As a young boy I went briefly to their school and did a show near one Christmas. Her surname was Cooper but Mona used the name Johnson at the Dance School. I also knew her son, Roger.